So soft and cushy! We love these towels and plan to buy more to replace the rest of our ratty old ones. 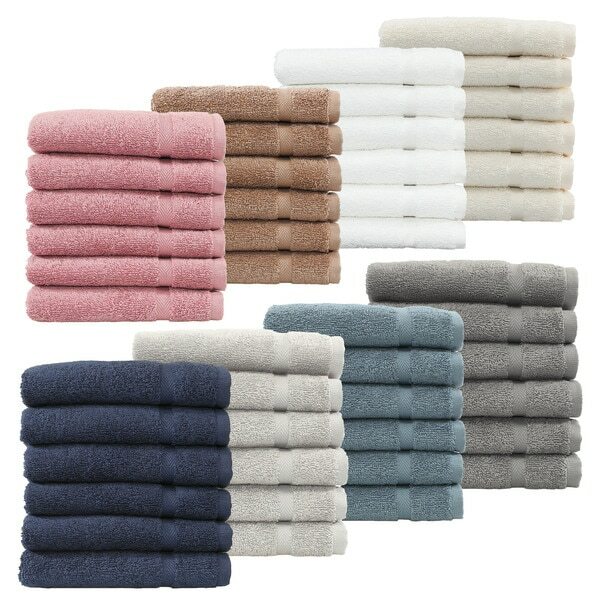 A uniquely authentic hotel and spa experience, this exceptional set includes six large washcloths is made from plush and ultra-absorbent Turkish cotton and comes in eight vibrant color options. These excellent pieces have been meticulously crafted with a crisp looped terrycloth design that prevents shedding and pilling, while maintaining unparalleled comfort. Replenish the great disappearing face clothes! How do my face cloths disappear? It’s not a problem when you have Overstock coming to the rescue! These cloths are quality made, a great variety of colors to choose from, and arrived as promised. If it was possible, I would of had a multipack of different colors in one group. I like colors! Great product, that I recommend. I ordered actually two sets of the Hotel and Spa Omni Turkish Washcloths. One set in white for my daughter and one set in the blue for myself. They certainly live up to they name and they wash and dry so nicely! Thank You Overstock for another great buy. Changed Rating - I ordered the tea rose color to match the bath towels and it is not the same color at all. So beware. It is a dark rose, not a soft pink as pictured. They both say tea rose, but only the same color in name. The positive things about the wash cloths are they are holding up really well and so soft to your skin. The wash and dry really well too. I love the thickness of the towels. Excellent Quality Wash Cloth, just need to be aware of the color issue. So it is still deserving of 4 stars and the Chat Line was a real big help fixing the problem. Very soft and great quality. I will buy another set in a different color. They wash well,no pilling. These will last for years. I just received my order of the Turkish cotton terry washcloths and very pleased with them. They washed well with no shrinkage, the grey color fits beautiful with bathroom decor. Great quality and price! I love these towels and the color that I choose (latte) ? Nice washcloths, soft and presumably will improve absorbency with subsequent washes; however, they are identical to Copper Grove Belgrad Turkish washcloths that I bought even in label but more expensive. There is a slight difference in the colors they offer, but they are identical products other than that. I specifically ordered the "Authentic Hotel and Spa Omni Turkish Cotton Terry Washcloths" to match towels I already had by the same brand. What I received was "Linum Home" washcloths, which are much thinner, poorer quality with pulls, and the band doesn't match the pattern on the Authentic Hotel & Spa brand. until I contacted customer service and complained. Great product wash out great good quality. This was my third state of sitz bath said that I purchased from eight overstock really love the quality of towels that are much bigger than what I expected which was great qualities great colors are great really really love the designing and on the quality of the product most of all. I found these to be nice and thick. Just what I was looking for. nice size feel soft the color was nice too! Ordered a set to go with my towels, and they are great. Just the right color and soft. They don't lose the softness after several washes either. I'd recommend these to friends! Love them, well made and heavy duty. Work great for my home! Very rich looking, and matches everything I have. Washcloths were nice quality and plush. true to advertising. colorfast, just the right size, absorbent and truly a great value for the money. Yes I would recommend them to a friend. Actually I have shared them with friends and they love them. These are not thin and flimsy but they are also not thick and substantial... not impressed with this brand. Very soft and good size. They are a bit thin and it ripped a hole taking plastic tag off. Overall good price for quality. I ordered white and it is a true crisp white. Nice size and good quality. Love these wash clothes.Highly recommend.Always satisfied with Overstock purchases. "Is this product made in CHINA?" No, these are made in Turkey. "What is the difference bet quality 1 & 20"
I dont understand what 1 & 20 is referring to? The washcloths are excellent quality. "Are any of these washcloth sets available in assorted colors so that each person can have their own color and prevent mix-ups, instead of having to buy all in the same color?" You would have to ask Overstock this question. I ordered the gray and all 6 were gray. can I get in three different colors? This Collection is approximately 550 GSM. Towels look soft and fluffy.